We created the videos above to walk you through the available theme options and how to add slides to the slideshow. Here is how to use other features that are found in the theme. Progress uses three formats: video, image and gallery. On any page or post you can choose one of these alternative formats to fit your media. In the right hand column, there is a box labeled format where you can select one. The “image” format will display the featured image right at the top of the content section of the site. You can see an example of this in the demo. The “video” format will show a large video in that section. You can see an example of that in this post from the demo. The “gallery” format is a bit different. It will let you display a slideshow at the top of the page similar to the one on the home page. This slideshow will include all images that have been uploaded while editing that page or post. You do not need to insert the images into the page/post content itself. Simply uploading them will “attach” them to the post for you. There is an example of the gallery format here that you can see. To include the staff section, select “yes” to include it in the theme options page. You’ll then see a new section added to your WordPress control panel just below comments. Here you can add your individual staff members. Adding one is very similar to creating a post. Just fill out the fields in the form. The main content box would generally be used for the staff member’s biography. Their image is the “featured image,” and the title, phone number, Facebook and Twitter fields are optional. The short content on the staff listing page is the excerpt. You can either create this by hand using the excerpt box, or the top portion of your main content will be used automatically. To add a staff page, you have two options. 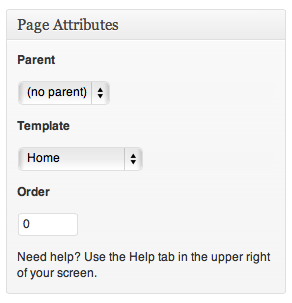 If you only need one staff listing, then create a new page and select the “Staff” page template. All your staff members will be displayed there. Should you need more than one grouping of staff members, you’ll need to create a staff type. Basically these work to organize your staff, just like categories organize WordPress posts. Just add a staff type, you can use any name you’d like, just be aware that it will be publicly visible. Once you’ve created at least one staff member in a staff type, you can then add that type to your navigation. Go to the appearance section of your control panel and select menu to open up the navigation builder. Look in the left hand side for staff types. If you don’t see staff types listed there, click the button in the top right labeled “Screen Options” (it’s in the help section in WordPress 3.3+) and make sure the box next to staff type is checked. Once that’s done, you’ll then be able to add your staff listings to your menu thus creating a page for them. Adding sponsors works identically to the staff member section above. The only difference is how the pages look and the optional information is geared to sponsor’s vs. staff members.